One thing I see a lot of beginners struggle with in FL Studio is how to navigate the program and perform simple tasks because of it’s unique layout and navigation. 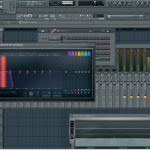 FL studio is a very involved and in-depth program so it can be a little difficult to navigate as a beginner. One thing a lot of beginners often struggle with is how to move instruments and samples on the step sequencer. I also see the same question come up when attempting to move tracks on the mixer. In this short tutorial we walk you through the simple steps required to perform both of these tasks. The easiest way to perform this task is using keyboard shortcuts. Staying organized and having an optimized workflow is a key component to audio production. A lot of times when you’re working on a track the amount of samples and instruments being added eventually get overwhelming. If you keep those things organized well you will be able to better manage sessions and keep things organized for optimal workflow. 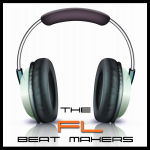 So let’s start out by talking about how to move tracks on the FL Studio step sequencer. The first thing you want to do is find the track that you want to move. Then you want to select that in the step sequencer by left clicking on that item. Now that you have it selected you can hold down the control key on your keyboard and then use the arrow up-and-down keys on your keyboard to move that on the step sequencer either up or down. I find this technique very effective when I am making a track because I am often adding a lot of different instruments and samples as I go. I like to keep items grouped together that coincide with my workflow. 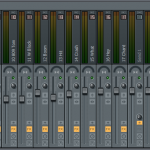 For example, I like to keep my drum tracks grouped together near the top of the step sequencer. However, during the typical composition stages I may not have all the elements of my drum sequences already in the step sequencer. So I use the method described in this tutorial. to move them to the appropriate area. 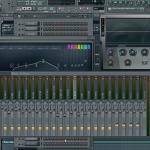 Moving items in the FL studio mixer works very much the same as moving items in the FL studio step sequencer. With the mixer window selected navigate to the track that you would like to move and select it by left clicking. Once it is selected you then use the control key and the arrow left and right keys on your keyboard. Using this functionality in the mixer is great when mixing down the track. It allows you to put elements beside each other that you want to mix with similar processing. As with the step sequencer I like to keep things group together in sections such as having a drum mix area, or all my brass in one area, etc. Thanks so much for taking the time to check out our website and this tutorial. If you enjoyed it please do us a favor by sharing with one of the options below.